Pie perfection at Di Fara's. A gothic crust, a sloppy splash of sauce, and thesweetest, freshest mozzarella. The best of its kind bya wide margin ($15.75). Mecca for grilled-pizza lovers. Try the Siciliano withcumin-scented ricotta ($14). 1814 Second Avenue, at 94th St. Consistently great, made with top-notch ingredients,and the city’s best cannoli to boot ($13). Gonzo’s Vincent Scotto taught the staff here howto properly grill a pizza, and they haven’tslipped since his departure ($10). The trash cans are overflowing, and the fansdon’t work, but the regular pies ($14) andslices are sublime, the Sicilian even better. 2287 First Ave., nr. 117th St. This dark, ancient pizza joint still turns out alovely, no-frills thin-crust pie ($10). 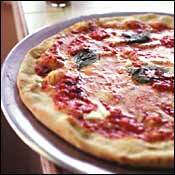 200 Park Ave., at 45th St.
Neapolitan-style pizza sold by the individual pie($14) or the half-meter ($28). It stands to reason: The city’s premier bakermakes great pizza with a superb crust. Try the Popeyepie ($12) and the pomodoro slice ($1). A thin-crust pie that outshines borough bossDenino’s ($12). An undersung restaurant pizza: superthin crust,terrific fresh mozzarella ($14).